This practical symposium will enable participants to become facilitators of change. They will be provided with knowledge to guide the implementation of innovative water and agriculture initiatives. Results will be improved access to water and sanitation, reduction of rural poverty, improvement of food security and creation of employment. Innovative approaches. Experiences with innovative approaches to reach the SDG6 and water related SDGs (Poverty, Food, Health, Employment). 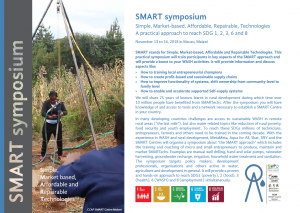 Examples of approaches are: FBM (Family Based Management), The Jacana business model, (supported) Self-supply, Well clubs, Faith & Water and approaches regarding HWTS; the Ethiopian Utility method and SWAM (Safe Water for All in Malawi). The program can be found through Program.